Heavy rain overnight has disrupted transport across parts of Wales and left some homes flooded. South Wales Fire Service were called to Clara Street in Tonypandy, Rhondda Cynon Taf, to help pump out water from four houses in the road. Trains between Swansea and Cardiff were delayed for a while following flooding at Neath, and a number of services in mid and north Wales are cancelled. Streets in Neath and Port Talbot were also flooded by the overnight rain. Mid and West Wales Fire Service reported properties had not been affected as yet but the council was providing sandbags to prevent water getting into homes. 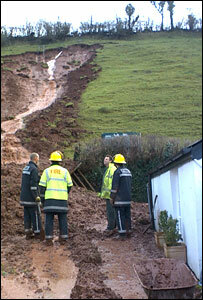 A spokesperson for the service said a large area has collapsed in a mud slide in Hay Street, Brecon, and water was getting into a farmhouse on the road. Crews were putting sandbags down and emergency workers from the council had been called out, the spokesperson added. 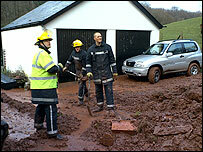 Powys council said a field had slipped and blocked a private roadway near Forge farmhouse. The house owner Sally Morris said: "I was clearing out a drain and I heard what sounded like a gust of wind, but when I looked up I saw the hill collapsing before me." The Dyfi Bridge at Machynlleth has closed on the A487 towards Aberystwyth and diversions are in place. Road closures in Welshpool are expected on Tuesday afternoon according to a council spokesman. Trains have also been cancelled in mid and north Wales. Lines affected are the Conwy Valley line between Blaenau Ffestiniog and Llandudno, the Aberystwyth to Shrewsbury line between Machynlleth and Newtown, the Cambrian line between Machynlleth and Aberystwyth and Machynlleth and Towyn. Further heavy showers were forecast for Tuesday. "It was breakfast time when the family hears a crash"